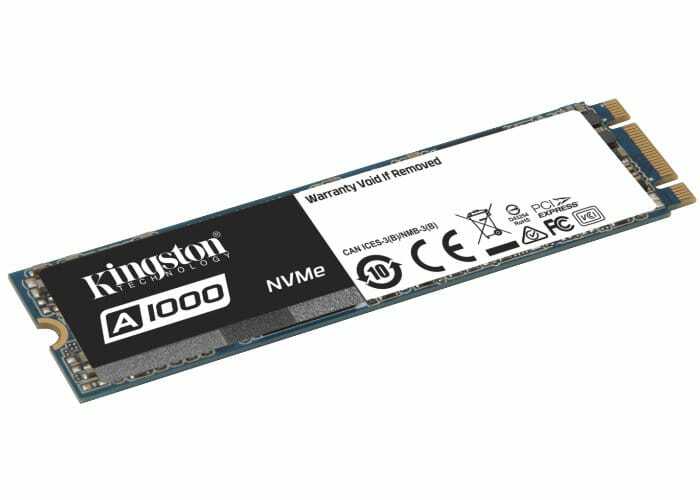 Kingston Digital the Flash memory affiliate of Kingston Technology Company has today announced the immediate availability of their new entry-level A1000 NVMe PCIe SSD which is available in 240GB, 480GB and 960GB capacities and is backed by a limited five-year warranty. The consumer grade PCIe NVMe SSD utilising 3D NAND storage delivers twice the performance of SATA at near SATA pricing. The single-sided M.2 2280 form factor measures just 22mm x 80mm in size making the storage ideal for notebooks and systems with limited space. The PCIe NVMe drive features a Gen 3.0 x2 interface, 4-channel Phison 5008 controller, and 3D NAND Flash. It delivers 2x the performance of SATA SSDs with read/write speed up to 1500MB/s and 1000MB/s giving it exceptional responsiveness and ultra-low latency. Features of the new hard drive include incredible read/write speeds the A1000 will not only increase performance but can also be used to breathe new life into older systems, multi-purpose SFF connector replaces small mSATA and mini-PCIe slots and PCIe NVMe Gen 3.0 x2 Lanes interface. Full specifications jump over to the official Kingston Digital website by following the link below.